Health insurance complexity presents a huge, unfair barrier that ultimately can prevent people from receiving the care they need. It can keep people from choosing the plan that best meets their health concerns, and it can prevent them from using their coverage to access care because they fear incurring unexpected, unaffordable medical bills. Speakers at the conference talked about how it is particularly difficult for most people to understand the deductibles, co-pays and co-insurance rules of their health plans. 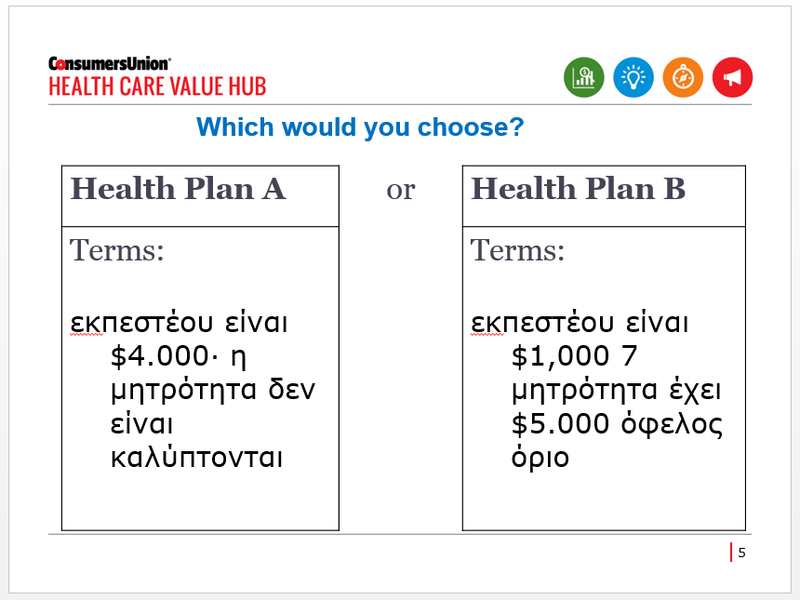 Quincy’s talk featured a slide that illustrates, “it’s Greek to me” when it comes to how people perceive the explanation of what they might have to pay for care if they get sick. Another speaker, researcher Kathryn Paez, related a story about a man who took a bus to the emergency room while having a heart attack because he was afraid his insurance might not cover an ambulance ride. Another challenge posed by insurance complexity includes obtaining up-to-date information on provider networks and what the financial consequences could be for obtaining out-of-network care. Which prescription drugs are covered and what the out-of-pocket costs for those medications could be, is also often very difficult to determine. Insurance should not be designed so that people are afraid to shop for it or are terrified to use it.